When I purchased my 2001 Audi TT Quattro Roadster, the seller only had one key to provide me. Not having a backup key made me a bit apprehensive because if I, say, accidentally locked the key inside the trunk or—worse—lost it altogether, a locksmith could charge $500 and replacing the entire ignition lock for a new set of keys could cost upwards of $1000. Not to mention the great inconvenience of needing either service. So I spent over an hour searching various Audi forums about how to duplicate the key and program the remote key fob. I encountered a lot of conflicting information and non-specific suggestions and speculation along with many uncomfortable price quotes. 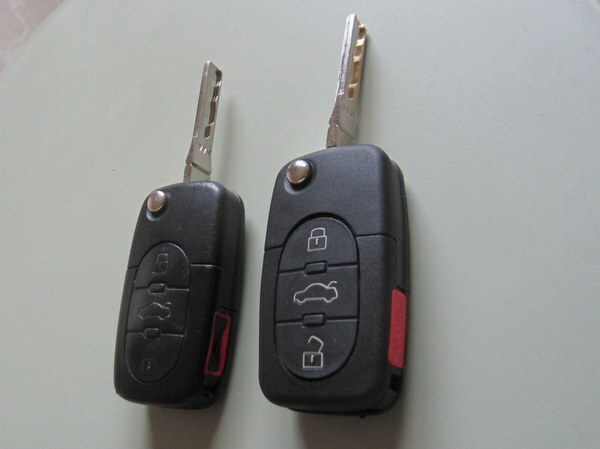 So this post is intended to clear up confusion for any other first-generation Audi TT owners out there by recounting exactly what I did in order to get a duplicate key and fob. Purchased online a new remote flip key from Your Keyless Remote for $61.99. This included the key blank, the keyless entry transmitter fob, fob battery (already installed) and shipping. (There were no taxes for this Colorado resident.) Note: it appears these are even less expensive on eBay! Brought my original key into Lock Safe Systems in my hometown of Fort Collins, Colorado. (I found them after visiting FindALocksmith.com, which lists members of the Associated Locksmiths of America.) They were able to cut the new key blank for $35 (no taxes on labor). It took them about 20 minutes to do so. This did not include programming the key fob, which they insisted I’d have to do myself. Followed the instructions below to program the remote key fob. Total cost of the above: $96.99. I consider how much I paid for this backup key “not too bad” considering all the different prices folks were quoting on various help forums. E.g., $200 from from a locksmith and $230-350 from a dealer (which would require a wait since the dealer would have to order the key). And again, locking out or losing an only key would incur even greater costs for a rescue. Consider the spare a form of insurance, then. I am keeping the backup key in a safe. The following instructions were provided by Your Keyless Remote when I bought the key blank and remote transmitter from them. Insert first key in ignition. Turn that key to the accessory position without starting the vehicle. Insert second key in driver’s door. Manually lock the door (turn right, clockwise). Press ‘lock’ on the new remote. After one second, press ‘lock’ again. Car should beep/chirp/flash lights to confirm programming complete. Actually, I think Step 1 is unnecessary. This is because a few months ago—when I only had one key—I replaced the battery on the original remote key fob and the remote no longer worked. I successfully programmed it by doing steps 2-4. The above is all I had to do to get my key and key fob working. If you are still having problems, see below. According to helpful readers of this site, there are two scenarios where the above instructions may be insufficient: 1) if your car was a “2001.5” model year Audi TT or later and thus had an immobilizer chip in the key, and 2) if the above instructions don’t allow you to reprogram more than one key fob for some reason. Apparently, some Audi TTs built for the 2001 model year and beyond (say, “2001.5+”) had an immobilizer chip embedded into the key. My understanding is that without this chip, the key is basically just a valet key, where the car would run in a crippled state. OR it may not allow you to turn on the car at all. I’m not sure which is the case, as my particular 2001 Audi TT Quattro Roadster does not have one. For anyone that runs into this problem of having to also program the immobilizer chip located in the key half of the remote: you should be able to find a locksmith that can also program that for you. If you call the Your Keyless Remote at 815-675-0404 they can locate a locksmith for you near to you. I’d recommend to get a quote from locksmith for how much cutting the key alone is, how much for the chip programming, and how much for both. Have him cut the key first and try it real quick (turning on your car). If it turns on you’re good to go, if not run back in there and have him program the immobilizer chip. Apparently it sounds like (from what I’ve been reading) Audi TTs made in 2001.5 forward have the immobilizer chip and earlier 2001 cars don’t. That may be why Felix’s remote doesn’t have one. Thanks to Luis who shared this valuable information in the comments. For at least one reader, the instructions at the top were insufficient for programming multiple key fobs. If that’s the case, follow the instructions below. 4. Turn key to off, remove from ignition and release button. Do this for each remote. Relink to seat positions (press and hold mem position #, then unlock button for 2 seconds and release both) and done. 1. Take a key (valet key works best, put it into the ignition and turn the key to the “on” position, so the dashboard lights come on. 2. Roll down the driver’s side window (not required, but a good idea in case there’s a problem). 3. Exit the car and close the door. 4. With a second key, physically lock the doors by turning the key clockwise (don’t use a remote). 5. Take the first remote to be programmed, press the unlock button. The lights will flash once. 6. Wait 10 seconds and press the unlock button. The doors should unlock. That first transmitter is now programmed. 7. Lock the door again (physically) with the key, (not the remote) by turning clockwise. 8. Press the unlock button two times with a one second interval in between, the lights will flash with each button press for a total of two flashes. 9. Wait 10 seconds and press the unlock button. The doors should unlock. The second transmitter is now programmed. 10. Lock the door again (physically) with the key, (not the remote) by turning clockwise. 11. Press the unlock button three times with a one second interval in between, the lights will flash with each button press for a total of three flashes. 12. Wait 10 seconds and press the unlock button. The doors should unlock. The third transmitter is now programmed. 13. Lock the door again (physically) with the key, (not the remote) by turning clockwise. 14. Press the unlock button four times with a one second interval in between, the lights will flash with each button press for a total of four flashes. 15. Wait 10 seconds and press the unlock button. The doors should unlock. The fourth transmitter is now programmed. 16. Remove the key from the ignition. Make sure that to test the newly program remotes, the original key is removed from the ignition since this exits the programming process. Someone might be a bit frustrated trying to test it with it still in ‘program’ mode. At least one Audi TT owner has had some difficulty accessing the programming mode. If it doesnt work then take the key out of the ignition and start over. Rinse, lather, repeat. It will go eventually. If you are still having problems after trying it more times than you can count, check the key is right one for year of car or that the key and battery are good. Thanks to Jeff who shared this valuable information in the comments. I figured I would have to spend about $200 for a new one. This post might help me. Does this allow you to start the car with the replacement key or just use the keyless features? It allows you to start and drive the car. The replacement key ends up being exactly the same as the original. Time to get a spare sorted I think! I only had one key and I lost it. If a get a new key do you know how can I program it? Because I wouldn’t have the first key that you mentioned for the procedures. Paulo, I believe (but am not positive) what you’ll have to do is contact your Audi dealership with your VIN. They might be able to order a new key for you from the factory. Once you do that, you can follow my procedure to program your keyfob. Failing acquisition of a new key, the Audi dealership may need to replace some components on your car. People on the Internet said that would cost over >US$1000. Whatever the price it’s not going to be cheap. Good luck! There is no limp mode without a chip. If a mechanical key starts vehicle, no chip required. The article above is pretty much correct other than the limp mode aspect, and the part about any need to replace perfectly good components. IF someone sticks key in a device, and it says there is a chip, you are in amateurville. ALL VW and Audi keys, approx 1998 have the chip in the key heads, weather or not there is a system to interact with the chip. “scanning” the key can create a false indication unless technician understands the chip status. 1. IF the vehicle is equipped with immobilizer, a key with a programmed chip is required. You can go to a dealer, if they have treated you like they love you, or visit a locksmith. There should be no reason to replace any components, unless something is malfunctioning. I made a client a second key, without remote for well under a hundred. 2. If equipped with immobilizer, your locksmith can read the required pin code and program keys, as well as remotes. Today I got skunked trying to program a remote… vehicle would not respond. This was being done with a diagnostic tool that turned out to be missing coverage for this year/model. Doing the two key biz did not work, it rarely does on an Audi. I have no accrued data to discern which will, which wont be user programming on the REMOTE, but the IMMOBILIZER key can NOT be done by owner, even with VCDS/ aka VagCom. There also could be a vehicle malfunction, preventing programming. 3. Buy the key, the remote, cutting the key and the programming from one source. The locksmith or dealer will usually not guarantee success with someone else’s parts. I personally only buy brand new components, not “reshelled” or otherwise reconstituted material sold cheap online. Save cheap for medications and major surgery, not for your car ! Also, beware of piracy. Lots of fake VagCom cables are sold online, to appeal to the miserly. They generally do not work at all, or have stolen software that has not been improved, because as the years went on, diagnostic tool developers began securing their software. Piracy has bad karma attached. The REAL VCDS/VagCom software is from Ross-Tech only, or their authorized resellers. You will still need a locksmith to read and provide you with your 4 digit pin code to USE VCDS to program immobilizer keys. The remote should not require this pin number. I do not sell online, please don’t request keys by mail. Patronize your local locksmith or if they are beloved, your dealer. We have an awesome Audi dealer here near Boulder Colorado, owned by Kuni dealerships. Can not say a bad thing about them. But weften can because we do not have to order them prepped or precut to fit. Thank you so much for this post I hope it will save me a ton of money. One question. On the website you gave they say that it comes with no programming instructions for the 2001 audi tt key and that you have to take it in to a dealer to program it. This isn’t true base on your post here is it? I need the key to use to get a remote car starter installed- will the key have all the same functions as the original key based on your programming instructions? Thanks for the help! Hi Melanie. The website for YourKeylessRemote.com does say “programming instructions are not included; This device requires cutting and programming by a dealership or locksmith,” but I think they just have it on there for legal protection in case a customer ran into programming issues. Because they did in fact include the directions noted in my post, and programming of the keyfob for 2001 Audi TT’s can be done by yourself! Any idea if this whole process would also work on a 2003 Audi TT? I can’t say for sure. I would speculate the process would be the same since a 2003 TT is of the same generation of a 2001, but more research is warranted. If you find out the answer, please let us know. I found a slightly different procedure on line that worked for me. Here is the link. The metal blade snapped off of my key, I have an Audi TT 2000. I lost that blade and it was my spare. It’s stuck in a parking garage and can’t get a tow truck to get access to the garage. I ordered a key from Audi via my VIN number. Will this key work on my car? Will they have to program it? The key should work on your car if Audi creates the right key based off of the VIN number. You won’t have to reprogram the key fob since I presume you will already be using your existing one, and it is already programmed. If not, reprogramming is easy per the steps listed in my post. If you have an immobilizer equipped VW or Audi with a flip key, and the pivot at the top of key breaks, you can grasp the key at the very top with vice grip pliars, and start the vehicle so long as you hold the remote up close to the lock where the antenna is trying to read the immobilizer chip which is embedded in the plastic, near the pivot. You then can go to a locksmith, who can replace the half of the key with the blade, transplant the chip ( if yours is 2001.5 or later, in the case of the TT ) or 2000 or newer on all VW, and 2002 on the VW Passat Wagon. No programming required, because the chip is ALREADY programmed to your vehicle. Locksmiths such as myself support automotive lock and immobilizer technology, program, match modules, deal with programming glitches by others, and supply new keys, remotes, fobs. Might be a good idea to ALSO make a complete second key or remote head key, so you will have a spare. Back in the day, up until 2004, all VW and Audi came with a plastic strip containing the key code and the pin code for programming. Once in a blue moon, a client still has it. After 2004, dealers no longer see the code, and can not get it from VIN, and the plastic tags dissapeared. Update of my post. I have tried and tried to pair my second key with the above info. I can get the new key to lock/unlock now. It the key safe icon in the dash is flashing and won’t start the engine. The original does. Any ideas please? Guessing your TT was made later than mine (2001) and the key has an immobilizer chip. You will need to find a locksmith or dealer who can program the immobilizer chip. Good luck! Unfortunately I don’t have any info on the 2000s, Karim. Anyone else? Good luck and let me know if you find anything. Thank you! By the way, I know you can separate the key to two pieces when changing the battery, but can we also open the part with the key? Cause when I press the bottum to open the key, it stops in the middle of the way! Thank you again. I’m guessing the blade isn’t concentric on its shaft. However, being about 9,000 miles away from my key right now (in Europe right now), I can’t confirm how easy it is to remove the blade or the shaft. Hopefully you have figured it out. Good luck! First off, thank you tons for this post. The internet needs more awesome people like you! I just spoke to a dealership parts person, and he tells me that there is an immobilizer chip that acts as an “antenna” like gadget that enables you to turn on the car. I realize it is simple to program the wireless entry remote portion of the key, but this “chip” is not mentioned in your post. Big thanks in advance for any advice. I believe that the keys for 2001 Audi TTs did not have such a chip but I do not know for sure when they were implemented (2003?). Anyone with better information, please comment. Apparently it sounds like (from what I’ve been reading) Audi TTs made in 2001.5 forward have the immobilizer chip and earlier 2001 cars don’t…. That may be why Felix’s remote doesn’t have one. Felix you may want to add this to your post? Luis, this is fantastic information. Thank you! I will add it to the post. I really appreciate your contribution. This happened to me when I replaced the battery on my original keyfob. All I did was follow the instructions above. Then all the buttons on the keyfob worked again. Try it and please report if it works or not. Good luck! Major bummer. I’m surprised it didn’t work. Did you try steps 1-4 in the instructions above? I only needed to do 2-4, but maybe in your case, having two keys (with one inserted into the ignition in the accessory position) is critical? If you did, I’m not sure what to do in your case then. What year is your car? ok, so finally, with a combo of your helpful info and the info below I was able to get my audie key working along with the keyfob buttons.. so, for ^4 for key/keyfob and $12 to have the key cut and some time and info from you I did it… saving a couple hundred dollars. Thanks! I had some diffuculty accessing the programming mode. If it doesnt work then take the key out of the ignition and start over. Rinse lather repeat. It will go eventually. Wow! Glad you got it working, Jeff, and thanks for the update. That seems a little more complicated than what I had to do for my 2001 Audi TT Quattro Roadster. I liked how you also had details on what to do if you have multiple keys. Just to clarify, what model is your 2002 Audi? Is it a TT too, yes? Would you happen to know if the keys of an Audi TT 2001 Comfort module #8N7-962-267-A can be replaced by a 8N7-962-267-F. I am having a hard time to program my key on that new Comfort Module. (Not sure if it’s compatible) Let me know if you can help. I have no idea, Mike. If you find out the answer, please let me know. Good luck! How do i re-program used fob key that was used on another vehicle? I’ve purchase same exact model from ebay, replace the cut of the key from my broken fob and when i tried those programming steps “The lights will flash once” I always get four flashes on that FOB key and i;ve tried all kinds of steps and nothing. Thanks! Greg, see my comments below. I had the exact same issue as you, you need to find your Master Key that came with the vehicle. The flashing lights are asking for a recognition/code from the Master Key. Great info for sure!! One thing though, is this correct on step 2, “(turn right counterclockwise)?? You mean ” right clockwise” ? Good catch! Yep, I meant clockwise. I just verified that on my car and corrected the post. Thanks John! I was looking around for a way to program my audi keys. Its a 2001 TT. Your procedure worked as expected. I also noticed that as each key was being programmed, a sure way to tell that it worked was to look for solid red led illuminating (on driver side door, lock LED), as i was pressing the lock button on my key fob, twice while trying to program. On all unsuccessful tries, i did not notice the door security red led come solid. Hope these tips help someone out there. I got a new fob cut for my 2001 Audi. The only way I was able to get it programed was I had to install the Master Key in the ignition and turn it to on. The install the new fob in the door and turn it to the right and press the lock button at the same time. Turned the audi off and remove the master key and all worked well. No other option worked even spending a couple hours with the lock smith who cut the key for me. So…I’m having a real hard time finding someone to cut a key for my 2000 TT. I have 2 new fobs, and everyone I’ve called has indicated that these instructions will not work. I’d love to prove them wrong, but can’t get my keys cut! I called the guy Felix lists on this site, and he was adamant about NOT being the guy who cut these keys? I live in Las Vegas…can anyone help? I found the locksmith who was able to cut my keys by visiting http://www.findalocksmith.com, which lists locksmiths who are members of the Associated Locksmiths of America. That is after I bought the key blank and remote transmitter from http://www.yourkeylessremote.com/. Then I went into the shop and showed them my key. There were two guys in there, and one of them had some experience cutting the key. After the usual disclaimers (“we can cut it for you, but we can’t program the key fob”), they cut the key for me for $35. It totally worked and I am still using it to this day as my primary key. Doing a search on FindALocksmith for “automotive” locksmiths in Las Vegas yielded five results worth trying. It’s possible that the locksmiths you are calling are replying “no, I can’t cut a key” is because they don’t have the key blank on hand? So if you bought the key blank and remote from http://www.yourkeylessremote.com/, you might have better luck? Thanks Felix…I purchased my blanks from the folks you recommended…batteries and everything! Anyway, I’ll try the web search for locksmiths again and see what I can find. Thanks again…looking forward to getting this done! I can’t believe it is really that easy to program the key fob. I only have one key for my 2001 TT, and that is just asking for trouble. Let’s just hope that my car does not have one of those immobilizer chips. I am not the original owner, and I have no idea what part of 2001 it was made in. Will this work for 2002 Audi Allroad quattro 2.7t? I have only one key. I cannot say for certain, but I’m guessing the procedures would be the same. I would also assume that your 2002 has an immobilizer chip in it that will require programming. I’m glad the instructions worked for you. On my TT Roadster, the key fob could unlock the car doors (3rd button) and trunk (2nd button) with no problem after it was programmed. Do you mean this is not the case for you? Got the original key working again, used the valet key in the ignition. Will work on the new key later….. This is a great site Felix, and I needed several tries at the different methods to get a backup new key fob programmed when I bought by 2000 TT Coupe, imported from Japan under the 15 year rule. My particular car, even though a 2000, does have an immobilizer instrument cluster. So I have to date succeeded at 2 out of 3 actions: 1/ Found a laser keycutter in Vancouver, BC, Westcoast locksmiths. Their $13K cutter will duplicate the original new slots in your key by using some sort of heuristic algorithm to recognize the wear in your old key. Ten minutes and I had a working key blade 2/ Programmed the new key remote using the outside door lock method. Unfortunately, for some reason this deprogrammed my original key so I had to use the door Unlock method (wait 10 seconds and press Unlock again. ) This of course took a few dozen trial and error tries before I got it to work, but I now have remote lock unlock on the new key. But due to the immobilizer, I can start the car with the new key, but it stalls right away as soon as I release the starter. So I’ve ordered a Vag Commander cable to read the Special Key Code (SKC) from the cluster. I can apparently then use Vag Com/VCDS to program the key to the cluster. I’ll post the result. Trying everything to avoid using the dealer. I am into it about $110 US right now though, with the purchase of Vag commander (I already own a VCDS cable, that would have been another $300) so still not cheap. That sounds like a pretty arduous process for your imported-from-Japan TT in Vancouver… I admire your perseverance. Good luck with the Vag commander! Did it work? Got to lover the internet and all helpful fellow car owners. I just bought an Audi TT 2002 and it came with two key fobs but only one worked with the remote. I replaced the batteries like I have done on all my other cars over the years – nothing – dead as a doornail – then I followed step 2,3 and 4 at the very top of this blog and the keyfob worked again! I also learned that the physical key would be enough to lock and alarm the car, and to unlock and drive, this is good to know since most of our newer cars are keyless and you would be dead in the water without the key fob. Thanks for the tip on how to make the fob work again after changing batteries. Glad those steps worked! Thanks for dropping by my blog and for your comment! Thanks very much for the advice about reprogramming the Audi TT!